Ron Paul makes quite a campaign commercial. It’s interesting to see a candidate for president run on a platform of consistency, honesty, peace, liberty, and sincerity, and not have a single one of his opponents question his credentials on any of it. He faces only two obstacles: A corporate financed media who censors his victories, and a fear that a reduction in federal power would bring back the dark ages. I urge my readers to help with these two hurdles. On the issue of electability: If he wins the primary, Republicans will vote for him rather than Obama. Those supporters of Obama who are primarily anti-war will come around as well, since Ron Paul has far more credibility on the issue. On federal power: Much of the power of the federal government is recent. For example, I see people recoil when they hear he wants to do away with the Department of Education, as if doing so would put us into a situation where all the schools closed and children never learned to read. The Department of Education was created in 1979. If you went to school after that, do you think you got a better education than your parents? Taking the power over education from the teachers and communities and putting into the hands of federal policy makers has taken the substance out of learning and left it cold. Ron Paul seeks to put the power back in the hands of states, communities, and teachers, not to end education. Be heard. We can’t have the media convincing people that we don’t exist. We need to turn headlines like Poll: Romney leads New Hampshire, Huntsman in third, Perry in fourth into a rallying cry against a system trying to fix the vote for those in power. There is an old saying that In expanding the field of knowledge we but increase the horizon of ignorance. I would add a corollary to this: In increasing the scope of education, we but expand the ranks of the undereducated. There was a disturbing study released recently, which in a comparison of eight European and North American countries, showed Britain and the United States as having the lowest social mobility. This means that contrary to all the talk of achieving the American dream, much of your likelihood of success is set at birth. Why the change? As usual it is a fundamental flaw in our assessment of cause and effect. We only have so many days to walk this earth. Those of us who run the maze set in front of us may on average do better, but is it the maze or the mouse that makes the destiny? It may be the very education system that freezes social mobility. By increasing the scale of the public education system, we increase the resume requirements for employment. It becomes less of an issue of whether we have the drive and the potential, and more of an issue of whether we sacrificed enough years to the system. These are years the poor can scarcely afford when they are born into debt and have to claw their own way to success. When you hear a Libertarian talking about getting rid of the Department of Education, they aren’t trying to rid the world of public schooling, they are just advocating more local control by the states and districts. This will reduce homogenization of education, but if the net increase is positive, isn’t it worth it? Our education system is fundamentally flawed. It seeks the lowest common denominator in all things. Teachers are forced to follow a set, preapproved plan, rather than teaching their own interests which they are passionate about. It is not the knowledge we need to teach, but the desire to attain it. For example, people speak loftily about the need to teach history so that we will not be doomed to repeat it, yet the history we teach to children too young to understand the nuanced adult concepts like religion, geography, and greed that lead to war, and too young to have reference for time to understand the dates, is a history so dumbed down and manipulated that it is counterproductive. Remove this history from the first ten years of education, and you only need eight. Think of how much additional potential a child can attain with two more of those formative years to focus on what matters. Their desire to understand will lead them to history later in life. Especially in the digital age, the responsibility of education should be to grant literacy and the desire to learn. Once you ignite that spark, you can let people find their own way, and most of them will find a better one. Modern computerized teaching tools use instructions, reading, and video to teach a subject to an individual student. They occasionally interject quizzes, and based on the results, determine which teaching styles are most effective for the student, and which concepts they have grasped and are still lacking. The next lesson will be tailored accordingly. One of the most important questions for us to ask ourselves is: what are the goals of education? Is it to teach general knowledge? I see that as a path to failure. Pushing knowledge on those without drive is torturous. Is the goal to give students the skills they need in the field employment that will be most profitable to them and the country? If so, then we are failing. What they really need is literacy, questions, and the tools to find their own answers. These same problems that plague education also plague most other bureaucratic institutions, employers, and traditions. If you are in a position to do so, give someone their autonomy back, and while you are at it, take back your own. 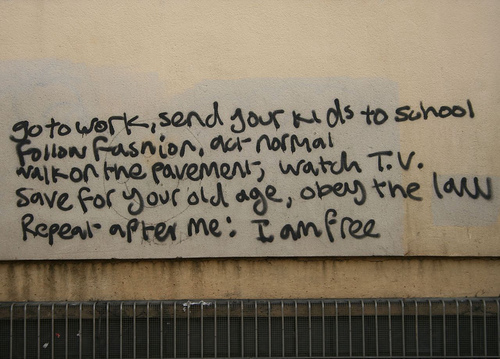 Remember, you are free. I posted a TED talk the other day that is somewhat relevant on the ethical nature of autonomy.